Please read our Terms & Conditions HERE because all participants and spectators at 5sports enter 5sports on the basis that they accept 5sports Terms & Conditions. All players and spectators at 5sports enter 5sports on the basis that they accept 5sports Terms & Conditions. 1.1 Every competition format is specified in each competitions details section, available on our website. 1.2 Teams will receive 3 points for a win, 1 point for a draw and 0 points for a loss/bye. Ladder positions will be decided by points gained, followed by goal difference, followed by goals scored, followed by the aggregate result between the two teams in question. 1.3 All players must be registered prior to competing for any team. Different competitions require varying number of players and the details will be provided on the website under “competition details”. The management reserves the right to vary registration details at any time. 1.4 Teams are asked to arrive 15 minutes prior to scheduled kick off times. 1.5 Teams must be on the pitch and ready to begin the match at the appointed kick-off time. If a team is more than 10 minutes late their opponents may claim a 3–0 head start, and at the management’s discretion, a 5-0 win (and a deduction of 3 competition points from the losers). 1.6 In the event of a team leaving the competition, 5sports management may replace that team. This new team will inherit the scores and points of their predecessors. No team joining after the halfway point can be awarded first or second place at the end of the season (in the result of a forfeit a 5-0 win and 3 competition points will be awarded to the opposition). 1.7 In the event that a team refuses to play another team the match will be awarded to the other team 5-0 and the team refusing to play will be deducted 3 competition points. 1.8 In the event that a team refuses to complete a match which has already started, the match will be awarded to the other team 5-0 and the team refusing to complete the match will be deducted 3 competition points. If the score at the time produces a goal difference greater than 5-0 then that score will stand. 1.9 A competition draw will be issued at the start of each competition and will be displayed on the 5sports website. All competition results and ladders will also be displayed on the website. 1.10 There will be no cancellation or refund of any competition or friendly game as, upon registration, a contract to play in a 5sports competition was agreed on. Any decision to cancel a game can only be made by 5sports management. 2.1 A maximum of eight players per game may be used. All players must be listed and checked off on the referee’s team sheet prior to kick off. 2.2 Each team may field four outfield players and a goalkeeper on the pitch at any one time. Teams have a maximum of three players for substitutes. 2.3 Any team playing an unregistered or suspended player will automatically lose the match 5–0 and be deducted 3 competition points. b2.4] Players playing whilst suspended may be barred from the rest of that competition or the centre, at the discretion of 5sports management. 2.5 Teams must be on the pitch and ready to begin the match at the appointed kick-off time. If a team is more than 10 minutes late their opponents may claim a 3–0 head start, and at the management’s discretion, a 5-0 win (and a deduction of 3 competition points from the losers). 2.6 Teams failing to appear for their designated fixture or not giving notice the day before of cancellation will have the match awarded to their opponents 5–0 and will be deducted 3 competition points. A second non appearance for any reason may, at the discretion of 5sports management, result in expulsion from the competition with no refund. 2.7a Substitutes can only be requested:• after a goal has been scored • when a team’s keeper has the ball in his hands NOTE: If the referee grants permission for the substitute, the opposition may also make a substitute provided they do not delay the game. 2.7b There are no limits to the number of substitutes that a team can make. Substitutes must stand outside the pitch perimeter and spectators must not enter the field of play under any circumstances. 2.8 A change of goalkeeper must be authorised by the referee. 2.9a For the safety of ALL players: All players must wear shin pads. No bare feet, thongs or sandals are permitted to be worn by any player. All other sporting footwear is permitted unless specifically stated by 5sports management. Boots with blades or metal studs are not to be worn. 2.9b The wearing of any form of jewellery, including (but not limited to) necklaces, bracelets, fitness bands and watches is not permitted during play. 2.9c Referees may refuse to allow players to participate in matches if: • they are wearing inappropriate footwear (see 2.9a) • they are not wearing shin pads • they are wearing any form of jewellery. Studded earrings may be acceptable at the management’s discretion and at the player's own risk. 2.10 All teams must wear matching coloured shirts or playing strips. No club or international jerseys may be worn on to the field. For the first infringement of wearing inappropriate jerseys, 5sports will supply bibs. Any further infringement will result in a 5-0 loss and deduction of 3 competition points. If required 5sports management will supply bibs to teams for the duration of the game (teams should not bring their own bibs to the centre). 2.11a The first half of the match will begin with one team taking a centre. The second half will begin with the other team taking a centre. All players must be behind the ball in their own half at kick off. The ball may be kicked off in any direction. After a goal has been scored the game will be re-started by the team who conceded the goal taking a centre. 2.11b A goal cannot be scored directly from a centre kick. The ball must first be touched by another teammate before a goal will be awarded. 2.11c The defending players must keep a distance of two metres from the centre kick. 2.12 The goalkeeper is the only player allowed to play or handle the ball inside the goal area. The goalkeeper may pick the ball up any time it is in the goal area. The ball is deemed to be in the goal area if it is touching the goal circle. 2.13a Outfield players may not enter their own goal area. An outfield player who enters his own goal area and touches the ball will have a spot penalty awarded against him. 2.13b Defending players may not run into/through their own goal area as a shortcut to gaining access to the ball. Offending players will have a direct free kick awarded against them from the point where they crossed the goal circle. 2.14 An attacking player may not seek to gain an advantage by entering his opponent’s goal area. The game will be re-started by the goalkeeper. 2.15 A goalkeeper seeking to gain an advantage by leaving the goal area or by playing the ball when it is outside the area will have a spot penalty awarded against his team. The goalkeeper may not reach outside of the area to pick up the ball. If a goal keeper’s momentum takes him partially outside the area when saving the ball - but the ball remains in the goal circle - no offence has been committed (this must not be done in a dangerous fashion, however). 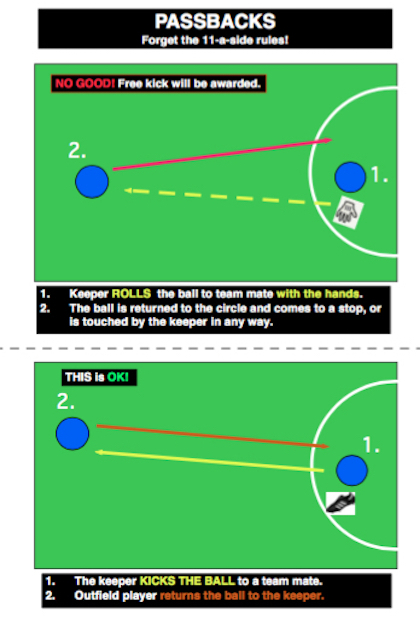 2.16a When re-starting play a goalkeeper must return the ball by rolling it out of his area with an underarm bowling action (henceforth known as a “roll-out”). If the ball is returned any other way a direct free kick will be given to the opposition two metres outside the area. 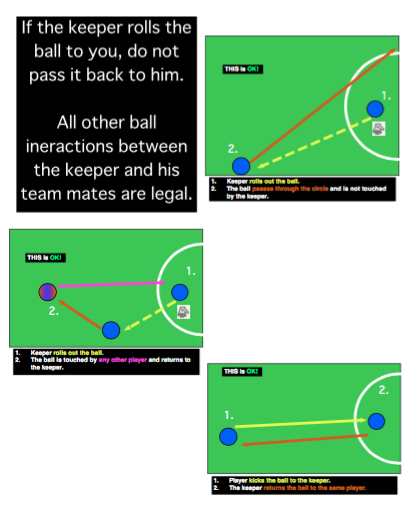 2.16b Pass backs: A teammate who receives a roll-out from the goalkeeper may not return the ball directly to him, whether deliberately or accidentally. The ball must first be touched by another teammate or an opponent. A direct free kick will be awarded when either the goalkeeper touches the ball again, or when the ball comes to a stop in the goal area. The free kick will be awarded at the place where the defending player returned the ball. This rule applies to roll-outs only. In general play the ball may be passed back to the goal keeper at any time. NOTE: Please see illustrations below for further explanation. 2.17 The ball must not be played above reboundboard height (1.2m). An indirect free kick will be awarded against the last person to play at the ball before it goes above reboundboard height, at the point where the ball was played. 2.18a The ball must never be played with the head even if it is below reboundboard height. A direct free kick will be awarded for infringement. 2.18b A player must not play the ball if he is on the ground. Shots on goal: When the goalkeeper is defending a shot on goal by the opposition the ball will be awarded to the goalkeeper for a roll-out. General play: When the goal keeper kicks or otherwise causes the ball to go high in general play an indirect free kick will be awarded to the opposition from the point where the ball crossed the goal circle. 2.20 If the ball goes out of play via any other player see (2.17). If the referee deems that a player has deliberately kicked the ball from the arena as a time wasting measure a red card may be issued. If the referee deems that a player has kicked the ball out of the arena in a show of dissent a yellow card may be issued. 2.21 A goal may be scored from any point within the field of play. Goalkeepers cannot score directly in general play (the ball needs to touch another player on the way through - the opposing goalkeeper does not count), but can take part in penalty shoot-outs. Goalkeepers are not permitted to take regular spot penalties. 2.22a Players must maintain their feet at all times when they are engaging the ball and /or other players. Slide tackles are forbidden. Players must not use defensive slides to intercept a ball regardless of whether they are near another player or not. Players must not use attacking slides when shooting for goal or when passing. Lunges that result in slides are illegal. Goalkeepers are permitted to slide in order to save goals, but must not do so in a way that may be dangerous to attacking players. The referee will be the sole adjudicator on whether a player has legitimately slipped or attempted to slide. A player who makes a slide that involves contact with an opponent will be penalised and given either a yellow or red card. 2.22b Body checks, or charging of opponents is not allowed. There should be only minimal contact of players when near the boards. Players deemed guilty of forcing an opponent into the boards will have a direct free kick awarded against them and risk receiving a yellow or red card depending on severity. Please note that contact that may be deemed “legitimate” in the centre of the court may also be regarded as inappropriate near the boards. 5sports management may suspend and or ban any player for dangerous actions near the boards. 2.23 When the ball is played into the corners of the pitch, the player who retrieves the ball must be allowed to take the ball out unhindered by the opposition, without delay. A defending player who makes contact with the ball player while he is in the corner will have a direct free kick awarded against him. The ball player will have no more than 5 seconds to bring the ball back into play. 2.24 Serious foul play will be penalised with a spot penalty and the guilty player may face sin bin, send off, suspension or banning. Spot penalties for fouls are at the discretion of the referee. 2.25 Foul play includes the following:unnecessarily rough play (severe body checking, deliberate tripping, bringing down an attacker in a goal scoring situation etc) spitting insulting language / racial vilification / violent conduct / insulting / obscene gestures / repeated infringements. 2.26a All free kicks will be direct except for kickboard height infringements (see 2.17). Opposition players must be at least two metres from where any free kick is taken. Contravention of this rule will result in the kick being taken again from the place where the defending player stood at the time the kick was taken. If a kick is awarded on or near the goal area the mark may be moved up to two metres backwards to allow defenders to be two metres from the ball. 2.26b If, when taking a free kick, a player kicks the ball into his own goal a direct free kick will be awarded to the opposition from the point where the ball was kicked. 2.27 The goalkeeper must maintain a position directly in front of the goal when a spot penalty is being taken. Players may take a maximum of one step whilst taking a penalty. Example: A right footed kicker’s only movement will be either to his left foot before kicking, or kicking with the right foot from a standing posture. 2.28 Penalty shootouts will only be played during the finals or during knockout competitions. Every player on the field at the final whistle must take one kick each, (i.e. 5 shots each team) and if scores are still level sudden death rules apply. Sudden death when a team reaches a goal advantage after an equal amount of shots per team. 2.29 These Rules may be added to or amended at any time. 2.30 The Referee’s decision on all on-field matters is final and no discussions will be entered into either on or off the field with him / her about any decision. Players repeatedly disputing decisions may face yellow or red card action from the referee, and may be subject to suspension and/or ban by 5sports management. 2.31 Teams with any complaint against a match official must address it immediately with 5sports management. The complaint must be put in writing before leaving the centre and signed by the team captain. 5SPORTS management will assess all complaints on its merits. 2.32 In Mixed games, a team may have a maximum of 2 male players in the outfield at any one time. 5sports promotes fun and fair play and as such will not tolerate any antisocial behaviour on the premises. 5sports management will take all steps necessary to ensure that teams participating within competitions comply with this approach. 3.1 Violent conduct on or off the pitch will result in the immediate suspension of the individual and could result in a ban from all 5sports facilities. 5sports management reserves the right to ban a team or individual from further participation in all competitions. 3.2 Referees must be treated with respect by all teams. Players and or teams may be suspended and/or banned by 5sports management for abuse/harassment of referees, on or off the playing field. Swearing at referees will NOT be tolerated and offenders will be issued a red card and suspended for a minimum of one week, at the discretion of the Referee’s Coordinator. 3.3 Excessive appealing for free kicks, aggressive appealing, and repeated arguing over referee decisions will not be tolerated. Team captains may respectfully clarify a ruling with the referee providing it does not disrupt the flow of the game. Other players should keep their communication with the referee minimal and respectful. Referees will issue a yellow or red card to any player who, in the opinion of the referee, breaches this rule. 3.4 Players may be “sin binned” at the referee’s discretion. The duration of the sin bin will be 2 minutes for which a yellow card will be shown. A player may only be sin binned once per game as a second offence involving a yellow card will automatically be followed by a red card and removal from the game. 3.5 A player sent off for a second offence may be suspended for a minimum of one week. In the case of serious foul play, foul or abusive language, a straight red card may be issued and an automatic two week suspension may be served. 5sports management will solely determine suspension and/or ban durations. 3.6 If a player is given a red card whilst off the field of play (for unacceptable conduct on the sideline) the team must correspondingly reduce the number of players on the field. 3.7 Any player issued a red card may be asked to leave the premises by 5sports management. Players must provide their name to the referee at the time of the infringement (this applies to yellow cards as well). A player who refuses to provide his name to the referee (or provides a false name) will be suspended. If a player refuses to provide his name to the referee, the team as a whole is bound by these conditions to provide it to the referee. Failure to do so may see the game abandoned and the competition points awarded to the opposition. 5sports management may enforce a suspension/ban for any duration. 3.8 If a teams’ on field numbers are permanently reduced by two players, or temporarily reduced by two players the game will end. The match will be awarded 5-0 to their opponents and they will be deducted 3 competition points. If the score at the time produces a goal difference greater than 5-0 then that score will stand. 3.9 If a match is abandoned for any reason the team at fault will receive a 5-0 defeat and have 3 competition points deducted unless the opposing team already has a greater advantage in which case the score will stand. If both teams are judged to be at fault the game will be void and no points will be awarded. 3.10 The decision of 5sports management in all matters pertaining to the administration of competitions is final. 3.11 5sports management may overturn a rule if it is perceived that a team is deliberately using an interpretation of the rules to gain an unfair advantage. 3.12 Any notification of further or extended suspensions or bans will be provided to the individual through their supplied email address. It is the players’ responsibility to check their email for notifications if currently serving a suspension. 3.13 Any player suspended or banned from 5sports as a result of breaking any of these rules is not eligible for a refund or credit.